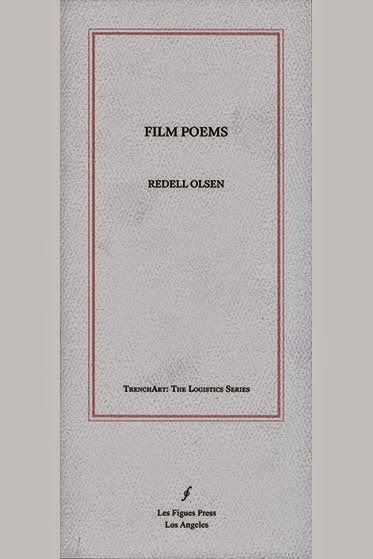 Film Poems (Les Figues, 2014) collects British poet Redell Olsen’s “texts for film and performances from 2007-2012.” As Drew Milne opens his extensive introduction: “This book brings together five poetic sequences, proposing film poems as the compound title—genre even—for these different texts.” The works that make up this collection—“London Land Marks,” “A New Booke of Copies,” “Bucolic Picnic,” “The Lost Pool” and “S P R I G S & spots”—are curious in part simply because of the form in which she composes: not for the page or the stage but for the screen itself. Given the range and breadth of poetic composition, from performance poetry to visual and concrete poetry, it would seem curious that there aren’t more poets composing specifically for film or video (especially given the variety of videopoem festivals around the globe). Utilizing variations on the essay, lyric repetition, sound, description, prose and the prose-poem, and a variety of rhythms breathy and breath-less, the range and possibility of Olsen’s ouvre is immense, and quite impressive. As she writes in “Bucolic Picnic / or, Toile de Jouy, Camouflage”: “first as a painting / off cuts of brazen // dazzle of fabrics / forbidden threats // of elsewhere // sets sells sails [. ]” Given the works were originally composed for the screen, how does one read them solely on the page?